Homemade heavy-duty chassis table build. 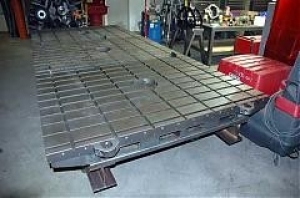 Assembled from discards, the table is 6 x 13.5 feet in size and weighs 12,000 lbs. Casters allow table repositioning by 2 people. My Uncle was famous for overbuilding and I picked up the mantra that bigger and heavier is always better. Are we related? That thing ought to be a source of envy to fellow chassis builders! Even just sourcing the parts and refinishing the surface must have taken a lot of work.